I recently attended a small dinner party in my neighborhood. Only seven guests attended, and three of them shared personal experiences about the cost of higher education. One man I spoke with is a hospital administrator. He told me he regularly meets intern pharmacists at his hospital who have $200,000 in student loans, even though the market for pharmacists is saturated. A woman at the party confided that her daughter borrowed $200,000 to obtain an education, and a young man explained how much it is costing him to obtain an MBA. I try to keep abreast of higher education costs. Nevertheless, I was shocked at the cost of an MBA program at public universities these days. An online MBA from Louisiana State University now costs $45,000 for two years of study. The University of North Carolina, my dinner guest told me, charges $70,000 for an online MBA. And an MBA from the University of Texas (my own google search revealed) costs $100,000 for two-years of study, when living expenses are included. My dinner partner chose to enroll in a new MBA program at LSU Shreveport, which charges about $1,000 per online course. That sounds pretty reasonable. But there are 500 people enrolled in his first course! That's right. A regional public institution rakes in a half million dollars to offer just one graduate-level class in business administration. In 1980, I graduated from the University of Texas Law School, one of the top-ranked law schools in the United States, and it only cost me $3,000 ($1,000 a year for tuition and fees). Today, tuition and fees to attend UT Law School is $108,000--36 times time what I paid! How Did Higher Education Become So Expensive? How, over the course of just one generation, did higher education become so expensive? Differential pricing. Several reasons. First, the universities changed their philosophy about tuition pricing. Thirty years ago, public universities tried to keep their costs down so that even a poor person (a person like myself when I was young) could obtain a first-rate college education and even a professional degree. Of course, students from wealthy families got a heck of bargain, obtaining college degrees and professional degrees for much less than they would be willing to pay. But the universities' doors were open to anyone who met the admission requirements. Today, universities engage in what they call differential pricing. They set fees at a level that wealthy people are willing to pay and then they offer discounts in the form of scholarships, grants, and loan packages to "worthy" individuals who can't afford to pay the sticker price. Don't worry about the cost, the universities tell prospective students. The real cost of attending our institution is lower than the sticker price. But of course, no one knows how the universities decide which students get the discounts. Legacies, minorities, and students with high standardized test scores get the scholarship money; and the suckers are forced to take out student loans to pay their tuition bills. And so universities raised their tuition costs, especially in high-demand programs like business administration,veterinary programs, medicine and law. And they did this without paying any attention to the job market. Now we see law graduates who obtained their degrees from second- and third-tier law schools with massive amounts of debt and no job prospects. Money is no object. Second, a philosophy now prevails in many middle-class families that money is no object. If I can just get into the most prestigious college that will admit me, many young people tell themselves, I have a ticket to a better life. Or at least I can maintain the middle-class lifestyle that my parents achieved. If only that were true. Unfortunately, people are finding out to their sorrow that a degree in women's studies from New York University, one of the most expensive schools in the country, does not lead to a six-figure salary. The federal student loan program has sowed the seeds of catastrophe. 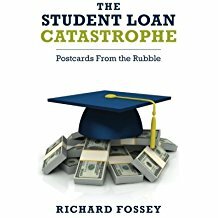 And finally, it is now obvious to nearly every honest person that the accelerating cost of higher education was fueled by the federal student loan program and student loans from private banks. Universities have avoided sticker shock about higher tuition prices because students simply borrow more and more money to pay their tuition bills. Moreover, although most people failed to realize it, higher education was costing more and more at the same time it was becoming worth less and less. A liberal arts degree was once understood as an experience that shaped young people's ethical values and helped them develop civic virtues and the capacity for moral decisionmaking. But the liberal arts have collapsed under the brutal assault of postmodernism. Why get a degree in history or literature when the professors insist there are no ultimate values and that the values of past generations must be deconstructed until everyone understands that all the nation's heroes were nothing more than despicable racists, capitalist exploiters, and male chauvinist pigs? Let's face it; sixty grand a year is a lot of money just to learn to be a cynic. As St. Paul observed, we but see through a glass, darkly. I don't know for certain where higher education is ultimately headed. Nevertheless it is now clear we are hurtling toward some sort of catastrophe at warp speed. In the next 10 or 15 years, we will certainly see the collapse of the non-elite private liberal arts colleges--those small institutions that were started 100 years ago by philanthropists and religious institutions. Many of the stately, ivy-covered edifices that dot the campuses of the nation's non-selective liberal arts colleges will be converted into condominiums. Professional education will evolve into something different and cheaper. We may see three-year law programs shrink into two-year experiences. Second- and third-tier law schools and MBA programs will close. In my own field--education--the public has already woken up to the obvious fact that colleges of education have done less than a stellar job of preparing school teachers and administrators. Alternative certification programs are booming, and student enrollments in education classes are steadily shrinking. Faculty numbers in colleges of education are also shrinking, and academic departments are closing or being consolidated. Online degree programs have begun to blur the distinction between prestigious programs at reputable institutions and cheap knock offs at for-profit colleges and less prestigious public universities. And that trend will continue and accelerate. For-profit colleges, many of which have preyed on low-income students, will finally be found out; and the great profits that were reaped by the owners of these dubious institutions will start to shrink. The sooner that happens the better. Of course, when the great shakeout in higher education is over, some colleges and universities will emerge unscathed. Harvard will always be Harvard, and it will become ever more apparent that the elite institutions still do what they have always done--issue credentials to the ruling class. Harvard began in the 17th century as an institution for training Protestant preachers--mostly pious prigs. It still is in the business of producing pious prigs, only the current crop doesn't believe in God. And the Greek system will also survive--binge drinking and womanizing never goes out of fashion. And here is my final prediction. Our smartest and best young people will figure out that American higher education is not doing what most Americans once thought it did--produce productive and knowledgeable citizens capable of leading happy, prosperous, and meaningful lives. And when they figure that out, they will decide just to skip the college experience altogether. College? Yeah, I went to college. Hi, just desired to let you know, I enjoyed this blog post. It had been funny. Carry on posting! Richard Fossey is a professor at the University of Louisiana in Lafayette, Louisiana. He received his law degree from the University of Texas and his doctorate from Harvard Graduate School of Education. He is editor of Catholic Southwest, A Journal of History and Culture. Student Loans, Bankruptcy, and Creditors' Lawyers: If Auschwitz Comes to the United States, Will Attorneys Handle the Paperwork? Suicide and Student Loans: Is There a Link? St. Catharine College and Dowling College are closing: "After us, the deluge."